I haven’t investigated exactly what businesses are located around this Maudie’s location but whenever I’ve been there for lunch, it seems like there are plenty of handsome men of all types – blue-collar, white-collar, rugged, polished. Any time I’ve chosen to go there, it’s because a friend invited me for a quick spot of chips, salsa and enchiladas – always good. Upon arrival, I’m always pleasantly surprised to see the room filled with great-looking guys – bonus. What is it about guys & steak? I don’t really care. All I know is that if you ever swing by Sullivan’s after 7pm and hang out at the bar, you’re bound to strike up a conversation with a great-looking, 30-something guy. Of course, the food is great but the reason I’d go there is for sight-seeing. With Austin being as casual as it is, Sullivan’s provides the perfect opportunity to dress up. So, throw on a cute dress with stilettos and head over to Sullivan’s because the low-lighting and close space invite romance. 6. Any triathlon – I mean ANY! Few people realize that the sport of triathlon includes a lot of beautiful people – men and women. So, even if you don’t aspire to swim, bike and run competitively, a great way to meet the athletes is to volunteer for an event – packet pick-up before the race or race registration are ideal for meeting a cute athlete, especially someone new while he’s fresh and conscious. Be advised that to train for 3 sports like triathletes do, takes a lot of time, early mornings and early evenings and long rides on weekends. What I’m saying is that you need to be confident, super-secure and willing to spend time alone on the weekends. Most of the time, if these athletes are forced to choose between their training and a girlfriend, guess what wins. If you’re a good enough cook, post-ride meals do wonders. If you prefer to race, this is one of those places you can count on the men swimming, biking or running after any of the girls they see in front of them. It will give you the opportunity to experience the thrill of the chase. . .literally. My friend, Vegas, is #90 here on the run segment of a triathlon. 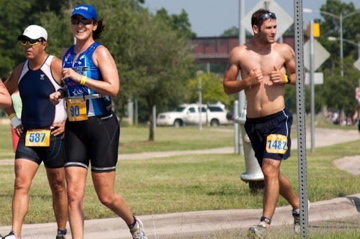 Running behind her, #1482, is precisely what makes Austin triathlons the #6 Hot Spot. This is definitely worth mentioning. I met a friend of mine here and was actually ultra-aware of the fact that I was one of a handful of women in a restaurant that was packed with Dell-ies on their lunch break. The place gets pretty packed so it’s likely that you’ll be asked by someone to share your table, should you have some space. Grab a girlfriend or 2 and sit at an extra-large table; you’re sure to make some new friends.